In December of every year, a choral extravaganza takes place under the direction of Angela Hawaleshka, the founder of AST. In 1987, this charismatic voice teacher began her choir with 6 members; they met in her living room, learned different styles of music, and enjoyed each others’ company! With Angela’s guidance, the choir has grown into a group of about 35 singers, which to this day includes several of the original members. For almost ( you could take out “almost” because we’re so close, and then we won’t have to re-write it for a long time!) 30 years, The Alexander Singers has been Angela’s hobby, joy and passion, and its members benefit from her dedication and years of professional experience. Through her nurturing, the choir has reached and maintains high standards. The Singers’ repertoire ranges from masses and opera, to spirituals, folk songs, sacred songs, Christmas carols and Hebrew songs. The audience always looks forward to participating in a sing-along! Do you have an unexplored passion for music? Would you like to learn, make new friends, and share in the joy of song? There’s no better time than right now! Rehearsals officially start in September, just after Labour Day. 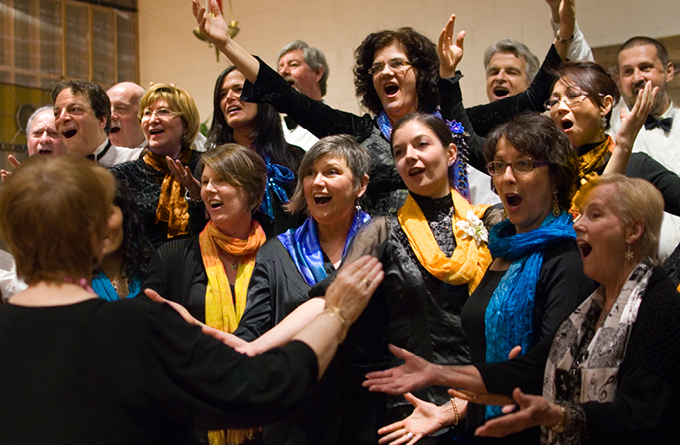 If you wish to join our choir, call Angela at 416-733-7937. She’d love to hear from you!